The use of electronic products for business has grown at an exponential rate in the past decade and it has become critically important to find safe, cost-effective, and sustainable ways to manage the end of their lifecycles. DC Environmental will help property managers find ways to recycle or reuse electronic equipment or components in accordance with local and federal regulations, which vary from each other, as well as those from state to state for e-waste recycling or reuse. The DC Environmental sales team is intimately familiar with all of these requirements and will provide the best proposal possible for either reuse or recycling. Learn more about these guidelines from the Environmental Protection Agency (EPA). As part of a targeted recycling and waste management program DC Environmental will organize, promote and manage Electronic Waste Collection Days for your building to ensure safe, legal collection and maximum diversion of your electronic waste. The EPA’s most recent e-waste report shows that the U.S. trashed or recycled 142,000 computers and over 416,000 mobile devices every day. 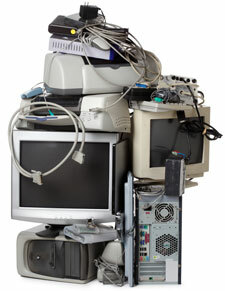 In 2012, the U.S. generated 3.412 million tons of e-waste. Of this amount, only one million tons or 29.2% was recycled, according to the EPA (up from 25% in 2011). The rest was trashed – in landfills or incinerators. Municipal Solid Waste Generation, Recycling and Disposal in the United States; Tables and Figures for 2013, US EPA, Feb 2014, Tables 12-14.